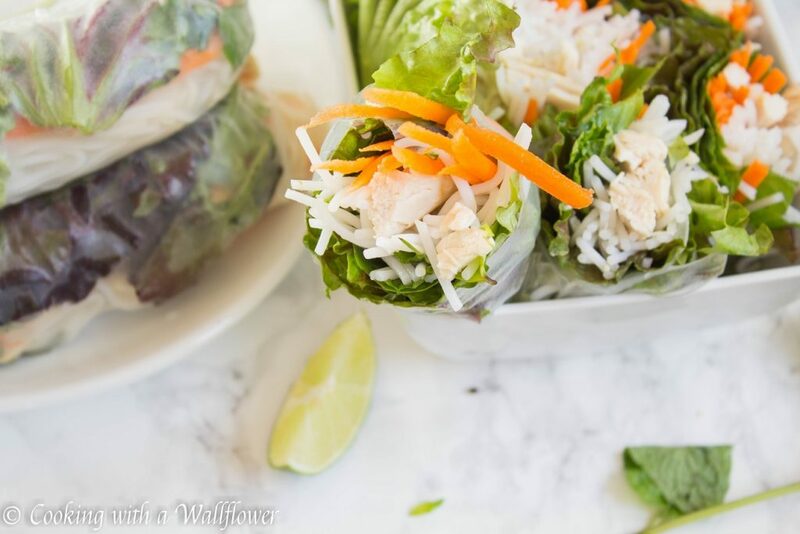 Spring rolls filled with shredded chicken, lettuce, vermicelli, carrots, mint, and basil then served with a citrusy tamarind sesame vinaigrette. 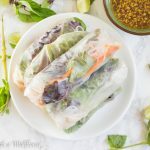 These chicken spring rolls with tamarind sesame vinaigrette is delicious, fresh, and healthy, perfect for starting off the New Year. I don’t know about you, but when it comes to meals, sometimes I feel like I eat the same thing all the time. It’s not that I don’t want to try something new, but when you’re working all day most days of the week, it’s hard to be creative on a daily basis. So that means that there are some weeks where all my weeknight meals are pretty similar, especially the weeks following holidays. It’s so difficult to get back into routine after all the festivities. Of course, it’s completely different during the weekends. Weekends mean I have a little extra time to play with new recipes, new flavors, new dishes. And I can get a little fancy with the plating. But shouldn’t we be able to have meals like that on a weeknight too? So I thought we could do spring rolls today. Have you had spring rolls before? Maybe you’ve tried them at Vietnamese restaurants. They look so fancy and prettily wrapped for you when you order them. 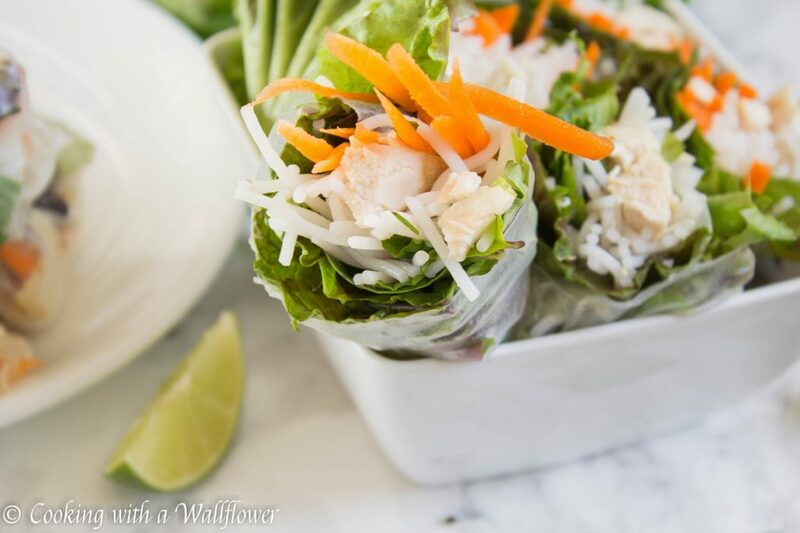 But you can easily make these easy to make and healthy spring rolls at home too. 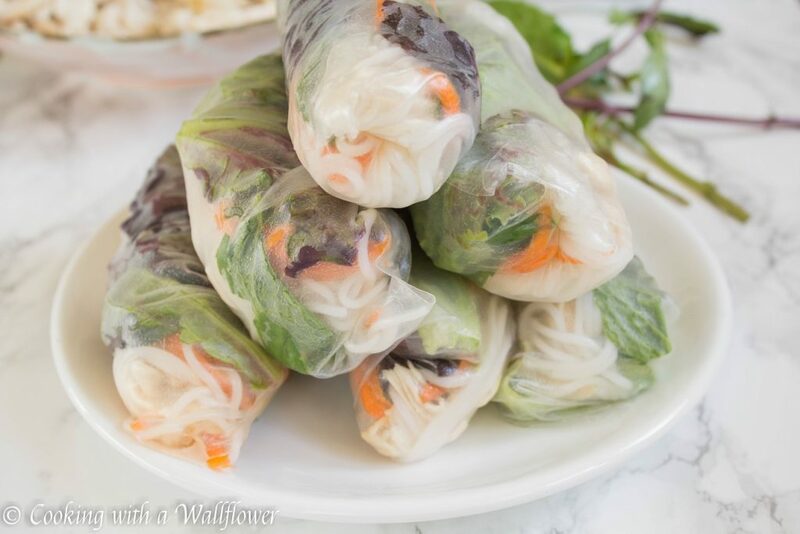 This is my take on the classic Vietnamese spring rolls. 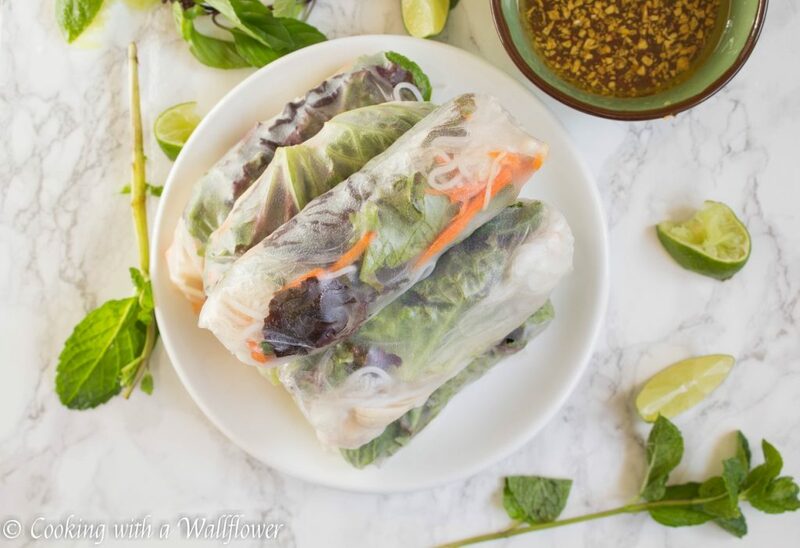 These spring rolls are filled with simple ingredients that you might already have in your kitchen. 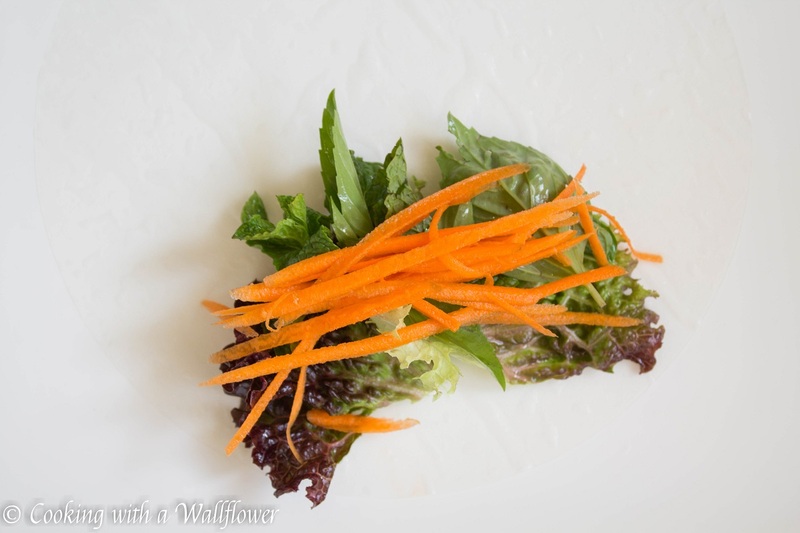 I used mint, basil, carrots, and lettuce, but you can use a salad mix too. I used vermicelli for the noodles. And for the chicken, I used Foster Farms® Simply Raised Chicken with No Antibiotics Ever Breast Fillets from Safeway. 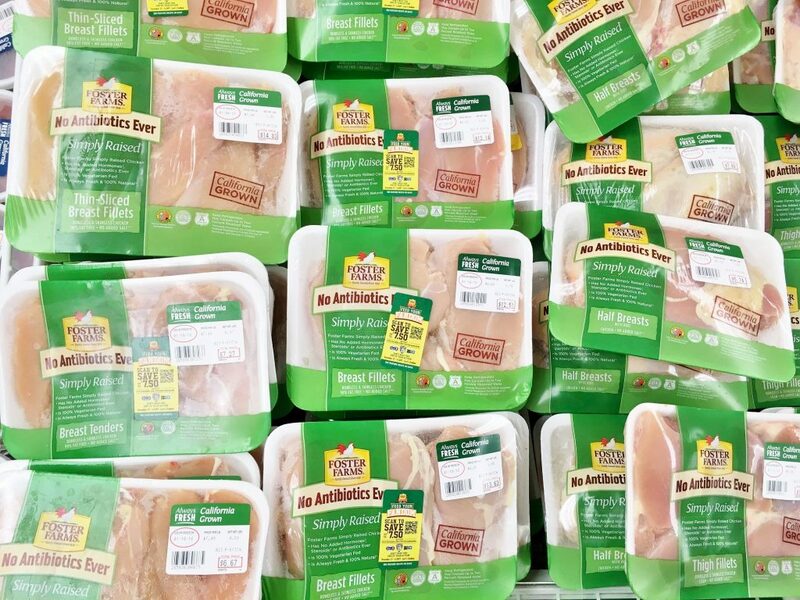 If you prefer other cuts of meat, Foster Farms® has a nice selection for you to pick from. 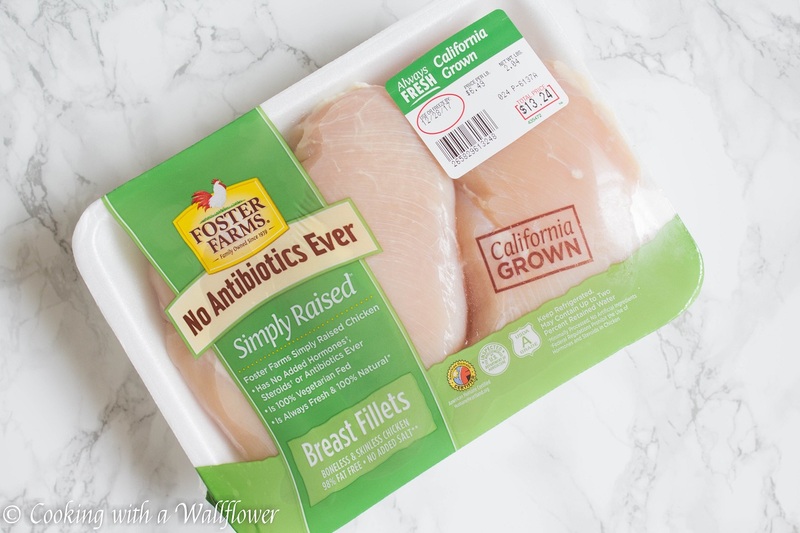 All of their Foster Farms® Simply Raised Chicken are California grown, 100% natural with no antibiotics ever, and 100% vegetarian fed. I personally liked the breast fillets for this recipe. Prep all the ingredients before hand. 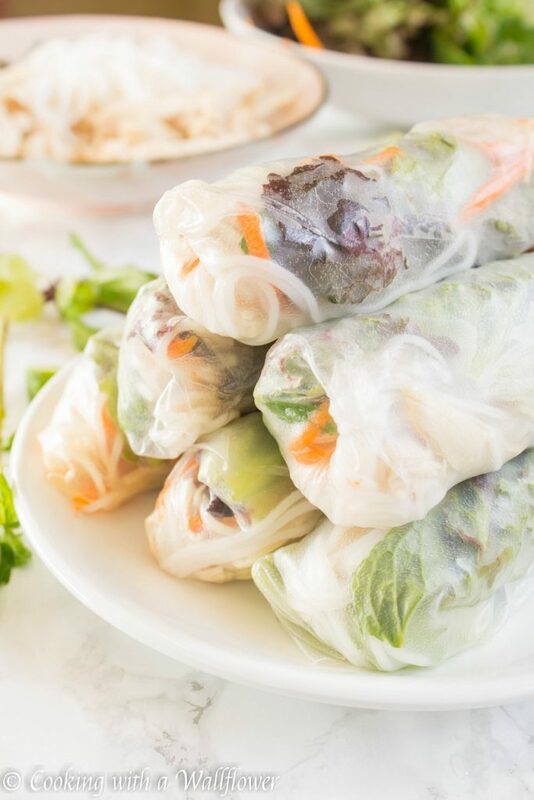 If you have all the ingredients on plates and in reaching distance, wrapping spring rolls is simple to do. If you have to constantly look for ingredients, it will take so much longer. 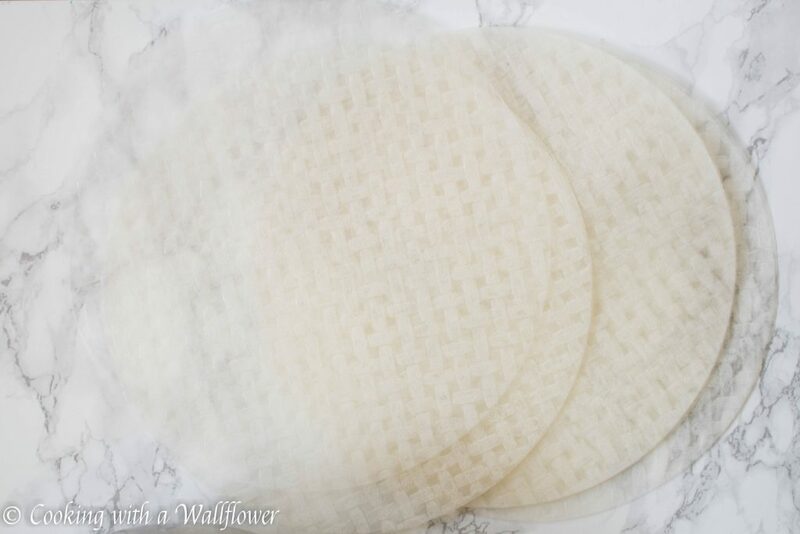 If you’re using rice paper, make sure that you’re wetting it in warm water. Cold water works too. It just takes longer for the rice paper to soften. 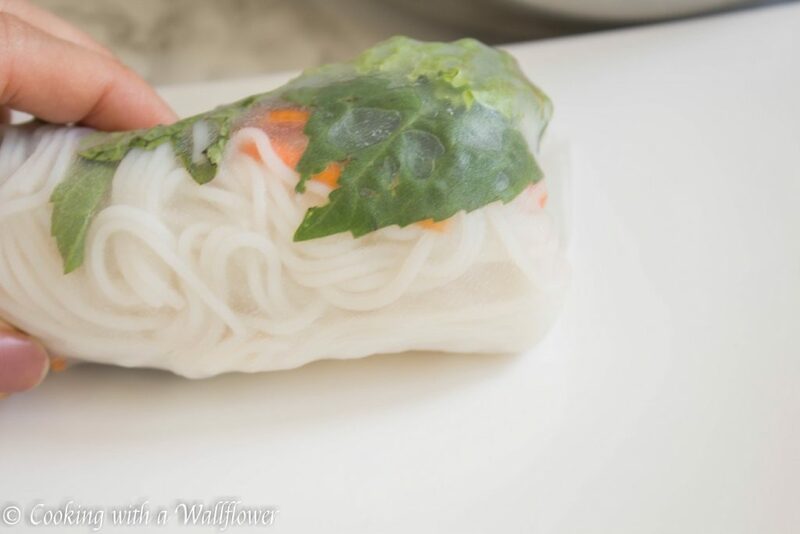 If you’re not able to find rice paper, you can make a spring roll bowl instead. Just place all the ingredients you would have added to your spring rolls in a large bowl instead. The most important part is to have fun! Don’t stress out if the spring rolls don’t come out perfectly. It takes practice for it to look perfect and even then, trust me, they don’t always come out perfect. But they’ll still taste delicious in the end, which is really what matters, right? These spring rolls are great as appetizers or as meals. For appetizers you’ll need just a couple per person, but for meals, you’ll definitely need more. It’s a great way to impress family and friends when they’re over for lunch or dinner too. To make the chicken, lightly season the chicken with a pinch of salt. Add about a tablespoon of olive oil to a medium sized skillet. Allow the olive oil to heat for about a minute over medium low heat. Add the chicken breast to the skillet and cook for 1-2 minutes. Flip the chicken to the other side and cook for another 1-2 minutes. Lower the heat, and cover the skillet. Let the chicken cook for 10 minutes. Turn off the heat but keep the skillet covered for an additional 10 minutes. Remove the lid and let the chicken cool to touch before using forks to shred the chicken. This methods ensure that the chicken is still tender and moist on the inside. To make the vermicelli noodles, follow the directions on the package. Boil the noodles for several minutes until they are tender. To make the spring rolls, prepare all the ingredients and set them out in reaching distance. Fill a large bowl with warm water. Have a flat surface plate in front of you so that once you dip the rice paper into the warm water, you can place it flat on the plate. Dip the rice paper into the bowl of warm water until all the surfaces are wet. Set the rice paper flat on the plate in front of you. 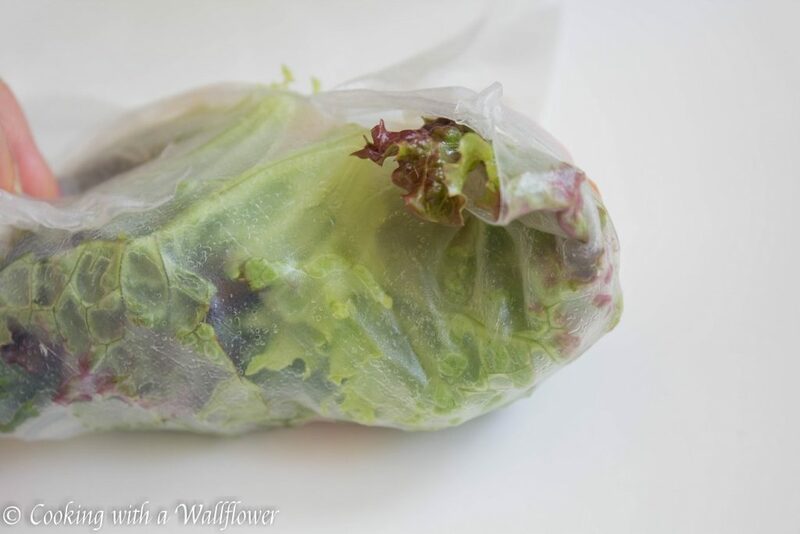 Place torn up lettuce on the edge closest to you. Then add several basil leaves and mint leaves and julienned or thinly sliced carrots. Add a small handful of vermicelli noodles on top of the veggies, about a 1/8 cup or so. You don’t want too much of the ingredients otherwise, it might be hard to wrap. Think of it kind of like wrapping a burrito. If there’s too many ingredients stuffed inside a tortilla, the tortilla will break. Next, add the shredded chicken on top of the vermicelli noodles. 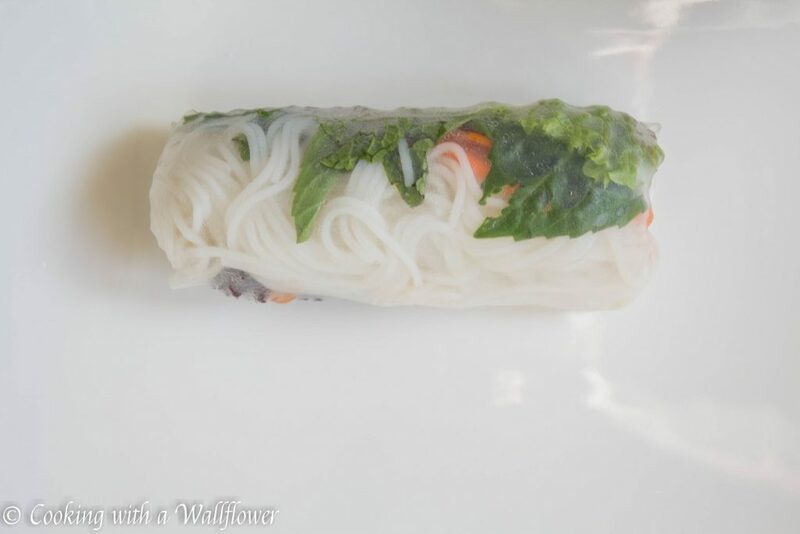 To wrap the spring rolls, fold the edge closest to you over all the ingredients. Next, fold the right and the left side towards the middle to close up the end. 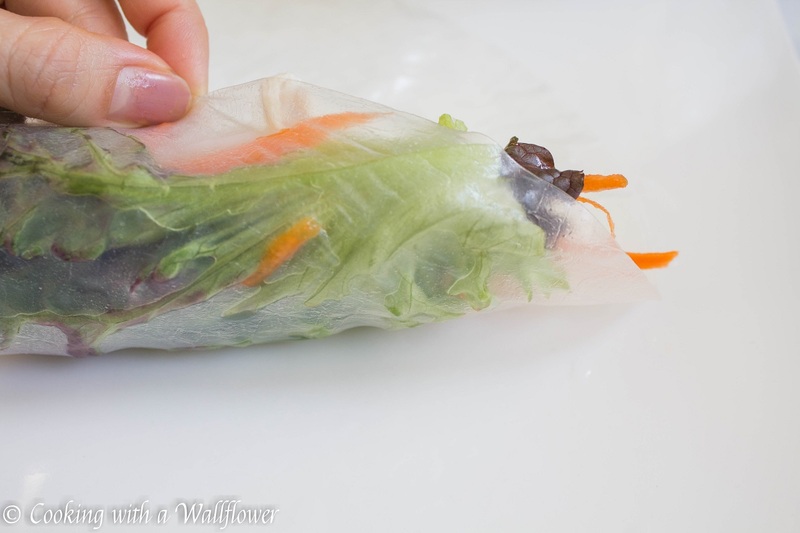 Then tightly roll the spring roll straight until you reach the other end. The tighter the spring roll, the less likely it’ll fall apart. 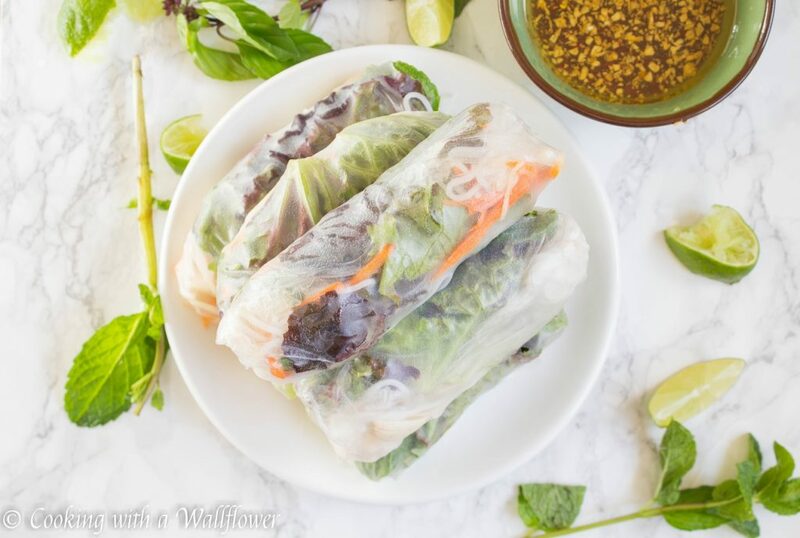 Continue doing this for as many spring rolls as you would like to eat. 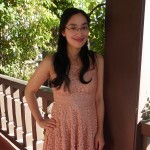 For the tamarind sesame vinaigrette, in a small bowl, mix together soy sauce, lime juice, granulated sugar, tamarind paste, sesame oil, and vegetable oil. Add chopped chili pepper if desired. If you can’t find tamarind paste, you can leave it out. It just enhances the sweet and sour flavor of the sauce. Serve the chicken spring rolls with tamarind sesame vinaigrette. Lightly season the chicken with a pinch of salt. Add about a tablespoon of olive oil to a medium sized skillet. Allow the olive oil to heat for about a minute over medium low heat. 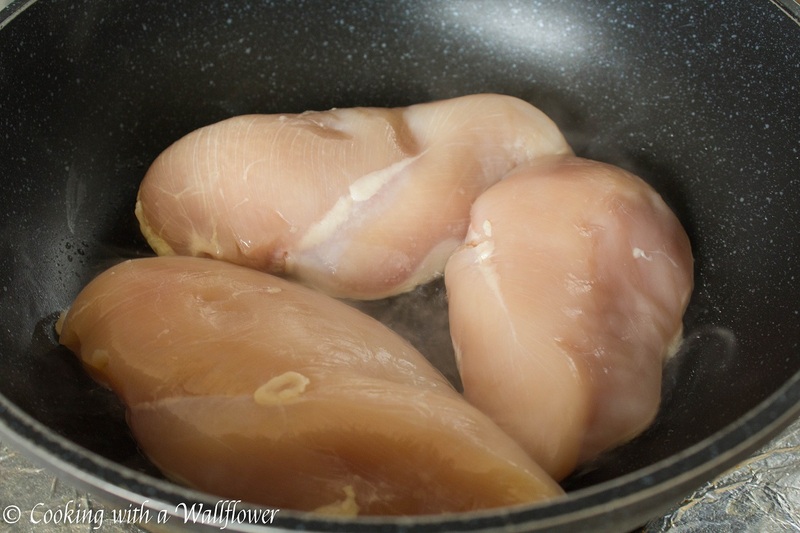 Add the chicken breast to the skillet and cook for 1-2 minutes. Flip the chicken to the other side and cook for another 1-2 minutes. Lower the heat, and cover the skillet. Let the chicken cook for 10 minutes. Turn off the heat but keep the skillet covered for an additional 10 minutes. Remove the lid and let the chicken cool to touch before using forks to shred the chicken. This methods ensure that the chicken is still tender and moist on the inside. Follow the directions on the package. Boil the noodles for several minutes until they are tender. Prepare all the ingredients and set them out in reaching distance. Fill a large bowl with warm water. Have a flat surface plate in front of you so that once you dip the rice paper into the warm water, you can place it flat on the plate. Add a small handful of vermicelli noodles on top of the veggies, about a 1/8 cup or so. You don’t want too much of the ingredients otherwise, it might be hard to wrap. Next, add the shredded chicken on top of the vermicelli noodles. 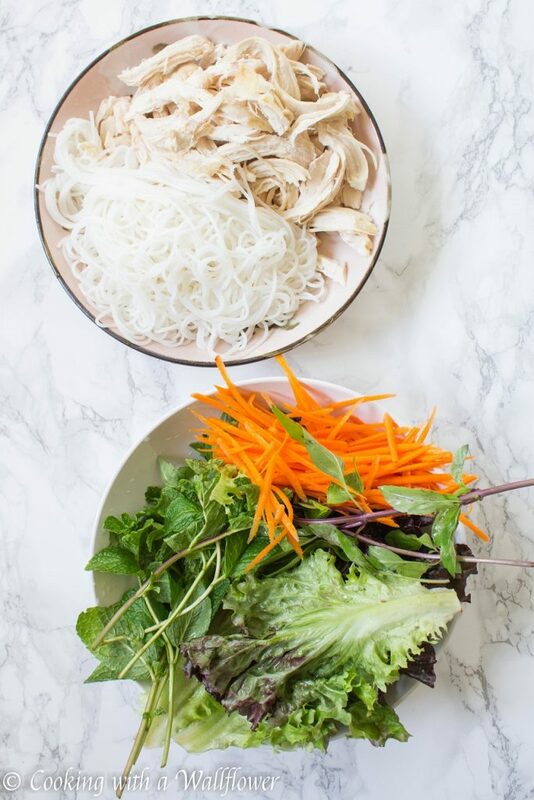 To wrap the spring rolls, fold the edge closest to you over all the ingredients. Next, fold the right and the left side towards the middle to close up the end. Then tightly roll the spring roll straight until you reach the other end. The tighter the spring roll, the less likely it’ll fall apart. 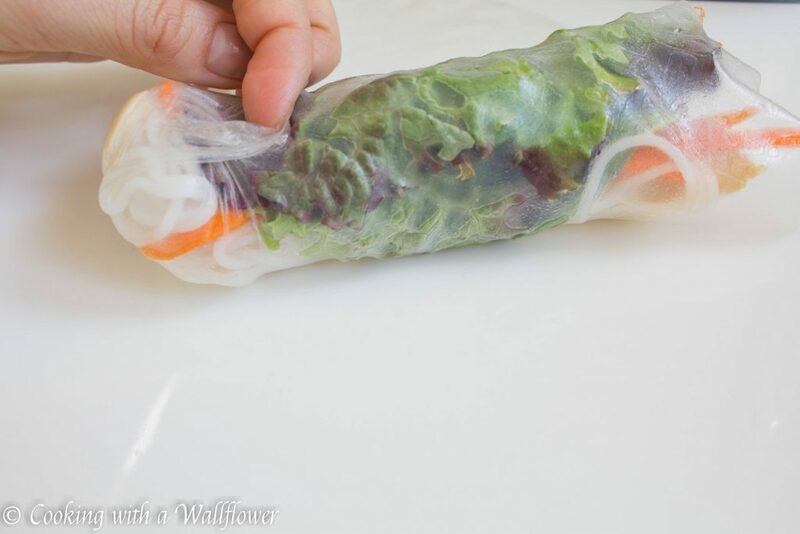 Continue doing this for as many spring rolls as you would like to eat. In a small bowl, mix together soy sauce, lime juice, granulated sugar, tamarind paste, sesame oil, and vegetable oil. Add chopped chili pepper if desired. If you can’t find tamarind paste, you can leave it out. It just enhances the sweet and sour flavor of the sauce. This post is sponsored by Foster Farms®. 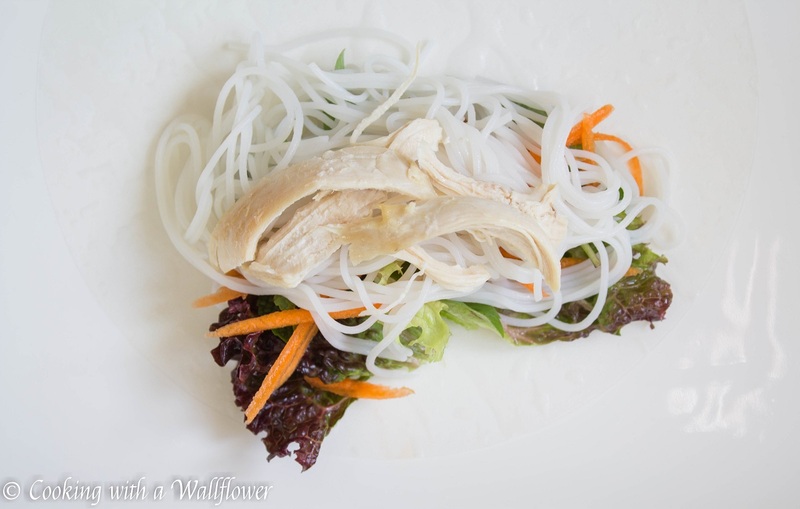 This entry was posted in Appetizers, Asian Inspired, Entree, Farmer's Market, Gluten Free, Healthy, Quick and Easy, Recipes and tagged appetizer, chicken, entree, gluten free, main dish, quick and easy, sponsored post, Vietnamese food. Hope you’ll get the chance to try this! Your wrapping skills are freaking amazing. Looks sooooooo good. I wish I had these today!